cret that Samsung has established its dominance as a leading company in Smartphone production. From its cutting-edge next-generation features and technology to its diverse range of smartphones for everyone in the demographic spectrum, Samsung has its submission hold on the world smartphone market share. But, some of their phones appear with some security measures, some security codes that prohibit a few network suppliers and the countries from enjoying them. As such an inconvenience prevails, the following 3 Free Samsung Phone Unlocking Software can come in handy. Tip: Not sure if your Android is carrier-unlocked? Check your Android lock status here. This Code Generator chiefly works through removing the codes, that typically block designated sim cards as of being used in the smartphone. As soon as the codes are eradicated, one can effortlessly make an LTE, GSM or CDMA equipped sim card work in the smartphone as they wish. Such a trick can enable people to have more options of network providers to decide from, which they didn’t have access to previously. Another giant motive to get you Code Generator is a detail that various smartphone companies frequently make their smartphones in a way; so as to, they can be used in designated countries only. 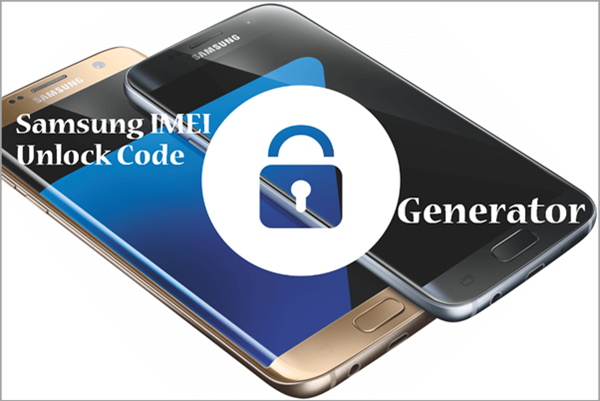 With this Free Samsung, Unlock Code Generator and you can unlock your smartphone and employ it spontaneously in spite of anywhere you live on the planet. Certain smartphone companies also confine the employ of the voice group calling. But, with this Free Samsung Unlock Code Generator, you can effortlessly and efficiently make the voice group calls with no restraint at all. Step 1. Get the free Samsung Galaxy Code Generator. Once you finish downloading, press *06# on the smartphone keypad and your phone will display the IMEI Number. This step is extremely important. Step 2. Now run the application and put in all the required phone info, along with IMEI number which was acquired in the previous step. Now all you have to do is click the “generate” button. Step 3. At this point, the application will start the code generation process. You may have to wait for a few times for the generated code to appear on your smartphone screen. Step 4. Once the code appears in your smartphone screen, note it down. Step 5. Remove the previous sim card; insert a new sim card. After that, put code and then press “OK”. Step 6. Then it will restart and will be unlocked after a few minutes have passed. 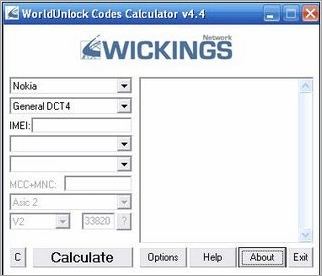 WorldUnlock Codes Calculator is a wonderful application which enables the user to unlock various mobile phones like Nokia, Sony, Samsung, Panasonic, Motorola and others. You can select your device by using its drop-down menu and get it unlocked easily. You can unlock your Samsung mobile phone using this application as well. However, this app is not compatible with Samsung Galaxy models. Step 1. First of all, you need to download and install WorldUnlock Codes Calculator to unlock your Samsung phone by generating IMEI code using the installed application. Step 2. Now, open the app and then select your device using the drop-down menu. Now you need to answer other details of your mobile phone which includes a model of the phone, manufacturer details, locations and IMEI number. Step 3. By entering all the data, click on the “Calculate” option to proceed. Then, a code will be generated by the app. Step 4. Now, you need to select the code on the basis of your device model and company. Then, restart your device. Step 5. After getting restarted, you will find your phone free from all the blocking codes and available to be used for fresh. Now, use your phone and set up the password as per your choice. It can be downloaded by taking very less space for the device. It is capable to unlock almost all mobile phones belonging to various companies. The Galaxy version of Samsung phones is not supported by this application. It is limited to only a few models of Samsung phones. FreeUnlock is another powerful website which can be used to bypass the codes and passwords of the Samsung mobile to unlock it for fees. It can be only used to unlock Samsung Galaxy devices. It does not require any other third-party software to unlock the device. It has an interactive interface which makes the unlocking process very simple and quick. Step 1. 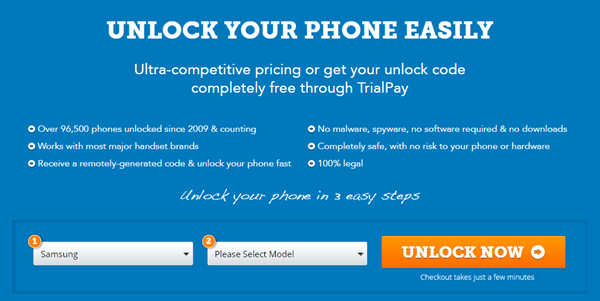 Go to the FreeUnlock website and enter the details of your mobile phone. You need to input your mobile number and the model of the device. Step 2. After entering the details, proceed to the next window by clicking on the “Unlock Now”. Now, you need to input your mobile phone details like model number, location and IMEI number and then click on the “Continue” button. Step 3. Select “TrailPay” to obtain your code for free using its tool. Step 4. Enter your email address and confirm it. Once the email address gets confirmed, you will receive the code generated via mail. Step 5. Now, you need to restart your phone by inserting a new sim card and then entering the code which you have received via mail. Step 6. Your device will get rebooted and then you can set up your device as per your choice. This website is very easy to use and can unlock the device in three simple steps. You can access the device using its URL. There is no need to install any app or software. It is compatible with Samsung Galaxy S5 devices only. Tip: If you come across data loss on Samsung phones or other Android devices, you can try this Jihosoft Android Data Recovery program to retrieve deleted data from Android phone directly. Now let us discuss the pros and cons of this application. Let’s start with the pros. The application is trouble-free to use and has the user-friendly interface. This is important as a complex interface may intimidate users. As far as cons are concerned, there are no cons other than the fact that this application supports only Samsung Galaxy models. But if you need to unlock other phones like LG mobile, you can refer to this article about the Best LG Bypass Tool to Unlock LG Phone without Code 2019.